On the morning of May 18, 1980, a 5.1 magnitude earthquake under the north face of Mt. St. Helens ended a two-month drama of magma build-up beneath the volcano. The earthquake caused a landslide that opened the way for the largest recorded eruption in the contiguous United States. It generated an 80,000 ft ash cloud and basically redistributed the top third of the mountain across 11 states, bringing the summit down from 9677 ft to 8366 ft.
Vertically diminished and quieter, the mountain today is still very much an active volcano, to the point that climbing permits are not issued some years because of volcanic activity. So when we were visiting Washington in April, 2014 and saw permits were available, we jumped at the opportunity. We decided to make the climb to the summit over three days, two nights, hiking in the first day to set up a basecamp, summiting the second day, then hiking back out the third day. We arrived at Marble Mountain Sno-Park in a cold drizzle and left the rental car there (Sno-park passes were $20/day, but we figured we'd just buy the annual pass for $40). From there, we began our hike north along Swift Creek. It was a steady uphill climb through short spruces and pines, on rocks covered with slushy snow. The rain was pervasive; it weighed down our rain layers and threatened to soak everything into a cold, hypothermic heatsink. We crossed to the west side of the creek at Chocolate Falls which, in late winter, was neither falls nor chocolate, but the lack of flow made it easy to cross. 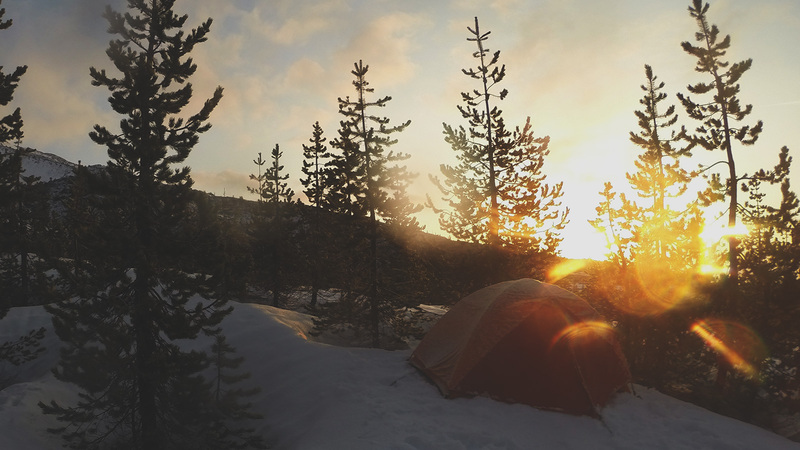 Beyond the falls, we continued north to just below the tree line and outside the permit zone, and set up camp. Climbing permits for Mt. St. Helens are required for hiking above 4800 ft on the mountain, but below that is Gifford Pinchot National Forest and, like most national forests, dispersed camping is allowed without permit or fee. We were cold and wet and hungry and wondering what we had signed up for. The first day was supposed to be the easy day, but here we were limping into camp. How would we ever make it to the top? More rain coupled with more exposure would seriously risk hypothermia. But it's amazing what a hot dinner can do. One by one, and on a full stomach, we addressed our issues. A dry tent and a change of clothes were followed by some clearer thinking. At least we could get our energy back in the tent. We would play it by ear the next day and see if we could wait out the rain while still leaving enough time to summit. That night, all we had to do was sleep. The next morning I was delighted to wake up to warm yellow light shining through the rainfly. It meant that the rain had passed for the time-being and that there was hope for a dry climb up to the summit. We were going to make a go at it. Above the tree line, the volcano-ness of the landscape was blatant. Rolls of lava rock, deposited by the flows after the eruption, still looked fresh and dynamic. 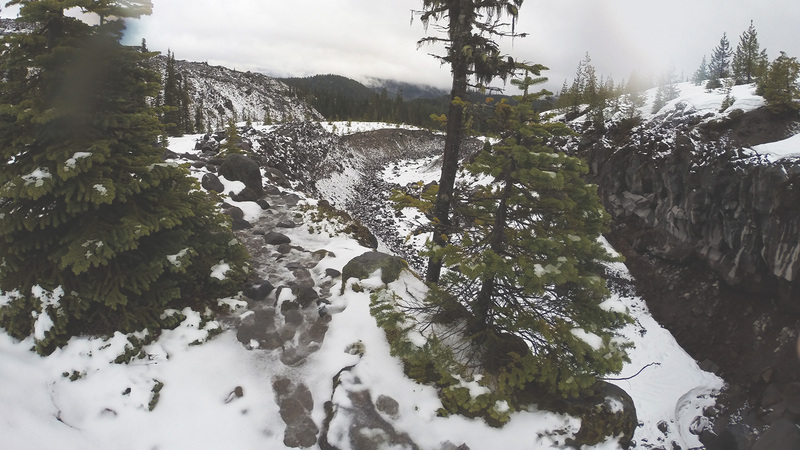 We tried hiking along the larger flows, the ones exposed above the snow, for better traction. And then failing that, we tried sticking to the little ridges of snow leading upward. The snow made things difficult. Some sections were steep enough to make me glad we had our ice axes, but other hikers made it up alright without them. It got steeper towards the very top where we had to take time to kick out every step in order to not slide back down. At last, we made it to the rim, over a vertical mile above where we had parked the car the day before. Up there, the wind was a sustained 30 kts at least. I couldn't breathe without facing leeward and even then, I didn't feel like I was getting enough air. I had arrived out of breath from the climb and couldn't recover. 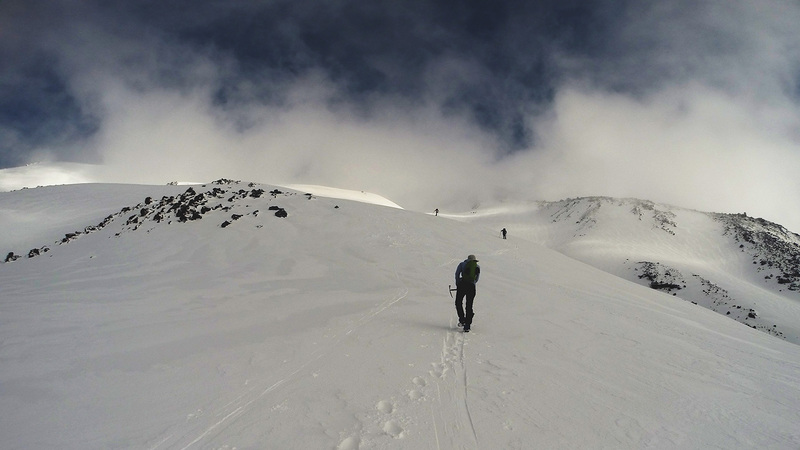 "Cornices," I kept thinking as I became hypoxic, "remember the cornices." These overhangs of snow, created by the fierce wind, are the greatest danger on the mountain because, when walking towards the crater rim, it's not obvious when you no longer have solid ground beneath you but are supported above the crater only by the strength of the packed snow. 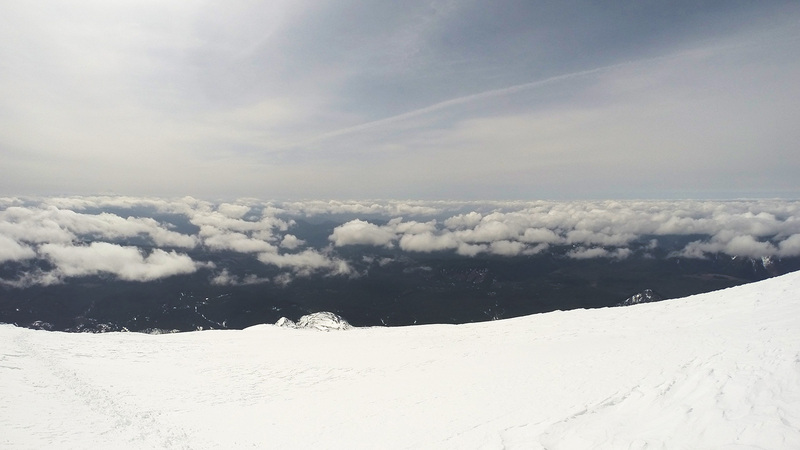 Cornices tend to collapse under the weight of climbers, causing them to fall hundreds of feet into the crater. And it was tempting to climb to the edge. Having made the effort to get to the top, why not take a look at the baby dome steaming at the bottom of the crater? Wouldn't that be an amazing photo? We resisted. I tried sticking the GoPro on a selfie stick and holding it as high as I could but couldn't get any shots into the crater. That would have to wait for a summer climb. Instead Joanna and I took a revolving video of ourselves like a pair of teenage tourists, then headed back down the mountain.